No one expected to take Jaden Smith seriously—especially not when the Fresh Prince’s son first hinted, as a preteen, that he shared his dad’s interest in rapping. How often does second-generation talent prove to be as valuable as the first? But here we are, on the eve of 2016, and it’s a borderline foregone conclusion that Smith will be a leading voice of his generation. How the hell did Smith come to demand so much of our attention and respect? To hear him tell it (via Twitter), it all started when his good friend Kendall Jenner played him Justin Timberlake’s stunning 20/20 Experience album closer, “Blue Ocean Floor.” But let’s backtrack: After starring in 2010’s The Karate Kid, in which he accomplished the rare feat of successfully rebooting a beloved franchise, Smith’s acting career suddenly stalled with the critical and commercial failure After Earth (2013). However, his cultural relevance only grew. He was linked to Kylie Jenner (in a refreshingly age-appropriate pairing) and made headlines with attention-grabbing costumes: Iron Man for a casual date and an all-white Batman suit for Kanye and Kim’s wedding. (“To heighten my experience,” he said later.) He dabbled in womenswear more brazenly than Young Thug. All the while, Smith was also introducing the world to his personality via increasingly bizarre tweets that suggested an, uh, “enlightened” perspective toward the world. Between the alphets, the social media presence, and the reported desire to be emancipated from his parents—at the age of 15—it seemed that Smith was destined to be Hollywood’s next cautionary tale about growing up in the abnormalcy of Tinseltown. Then, in the fall of 2014, his “Blue Ocean” remix dropped. It wasn’t his first musical release, but Smith’s rhyme over the aforementioned Timberlake song marked the beginning of his new identity as a Legit Rapper. The second verse finds Smith blacking out with a surprisingly nimble flow, venting mostly about girls, loneliness, and ennui—the three themes that characterize most of his work (and Millennial angst in general). The song opened up a floodgate of material that Smith began dropping with abandon. A random song there. A video with no MP3 there. A free, three-song project titled This Is the Album. Each featured more impressive rapping and songwriting than the last. For the open-minded, Smith was still the same kooky kid, but one who began to exhibit undeniable potential. Smith embraces his atypical persona in his music, and that’s why it resonates so well. He isn’t a child star gone insane via the Hollywood machine. 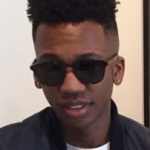 Instead, as his good friend and collaborator Donald Glover explained in a 2014 interview with Peter Rosenberg, Smith is the most extreme rich black kid that society and pop culture have ever seen. “He has room to fail,” said Glover. Together with his younger sister, Willow, Smith represents a new perspective. They are the teenage kids of one of the most famous stars on the planet. Why wouldn’t they react to a life of unlimited comfort and security by turning to existentialism? In their now-infamous November 2014 joint interview with T Magazine, the siblings expressed a desire to make music for themselves, because the options offered in popular music didn’t move them. It’s a kind of typical artiste thing to say, but when it comes to these two, really—who is making music for them to relate to? Smith might hang with Childish Gambino, or be inspired by Drake, or admire Kanye, but none of his elders can really know what it’s like to grow up as Will and Jada’s son. What Smith does share with his idols is a gestating fearlessness that is pushing him toward experimentation and innovation. There are signs of self-awareness too. Sometimes he tweets what seems like carefully mastered prose to bait his detractors and poke fun at his reputation. But then he’ll upload a video where he talks faster than the human need for oxygen will allow, a mind moving faster than even he himself can keep up with. When he floats back to a normal teenager’s plane of existence for something as typical as prom night, it’s with a flair only he can pull off (i.e., more formal superhero wear). In 2016, Smith released the solo loosie "Fallen" and hopped on tracks with Kid Cudi, Post Malone, Rich the Kid, and more, demonstrating his ear and versatility. He also scratched his acting itch, with a turn as an eccentric graffiti artist in Baz Luhrmann&apos;s fantastical hip-hop origin story The Get Down. In 2017, he cut his dreads off, rapped with Tyler, the Creator, and released new solo tracks "Batman" and "Watch Me," both accompanied by music videos. "I&apos;m tryna be hella extra," he raps on "Batman," and coming from someone else with a similar level of money and privilege it could hit your ears wrong. But Jaden Smith, clad in an all-white Batsuit, makes it sound natural. Like, how else could he be in the world? (The dreads he cut off, he brought with him as an accessory, to the Met Gala.) Why would we want it any other way? Rooting for Smith to win is increasingly reasonable. He&apos;s working on finishing his debut album, tentatively titled Syre, and he&apos;s got a new movie coming next year, Life in a Year, with Cara Delevingne. Oh, and he&apos;s part of the host committee for ComplexCon 2017. What lessons does the young gawd have in store? Really, anything he feels like taking on. Misfit children of the wealthy unite. Your leader is waiting.